September 14, 2018: New York enjoys two Off-Broadway companies devoted to the resurrection of lost, forgotten, or neglected plays. One is the Mint Theatre, led by Jonathan Bank, and the other is the Metropolitan Playhouse, headed by Alex Roe. Interestingly, both were born in 1992. 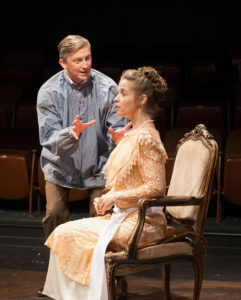 You and I, which premiered at Broadway’s Belmont Theatre, February 19, 1923 (during a season that saw 202 openings), was the first produced play by Barry, one of the many top dramatists emerging from Prof. George Pierce Baker’s “47 Workshop” at Harvard, where it won a much-vaunted prize worth $500. 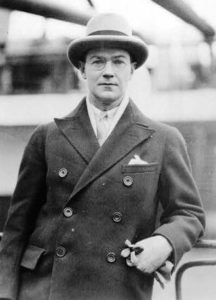 Its Broadway staging fared well both critically and commercially, garnering a then-respectable 174 performances, with one reviewer calling it “both entertaining and indicative of a very genuine talent that will augment as it finds form and learns shading.” Burns Mantle included it in his Ten Best Plays volume of 1922-23, whose best-known titles included Rain, Merton of the Movies, R.U.R., and Icebound, which the Metropolitan revived in 2014. 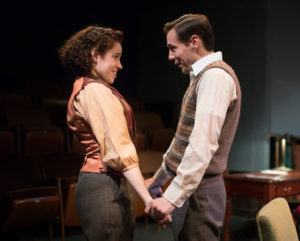 You and I, which has never received a local revival until now, resembles Barry’s best-known plays, Holiday and The Philadelphia Story, in being a drawing room comedy of manners in the vein associated with writers like Oscar Wilde, Arthur Wing Pinero, and Clyde Fitch. 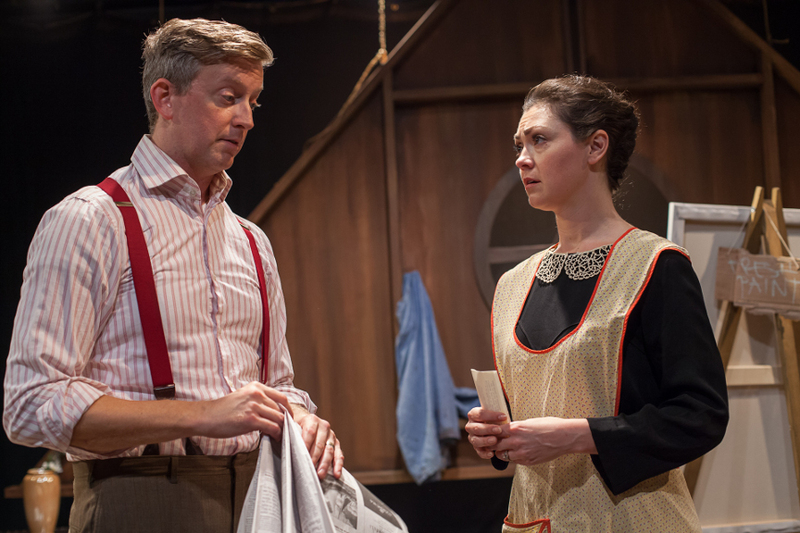 Its smart, well-educated characters, who live in a Westchester home with several servants, offer epigrammatic bon mots in the argot of the early 20s. Running beneath the surface superficialities is a mildly provocative theme suggesting that following one’s artistic dreams, even if it means making less money, is a better choice than selling out for financial security to a career in business. Of course, the playwright arranges things so that following such dreams can actually be just as profitable as the seemingly more practical way out. Barry’s conflict between pragmatism and idealism is embodied in the tale of Maitland White (Timothy C. Goodwin), called “Matey,” a youthful 43, who abandoned his aspirations to be a painter when, barely past his minority, he married the beauteous Nancy (Elisabeth Preston). The insecure life of an artist was thus exchanged for the steady paycheck of a soap company executive. Matey’s son, Roderick (Aidan Eastwood), or “Ricky,” the kind you expect to bound on saying, “Tennis, anyone,” hopes to marry 19-year-old Veronica (Rebbekah Vega-Romero). Following in his father’s footsteps, he wants to give up his own plans to study architecture in Paris so that he can make Ronny happy by earning a good living at the soap company. Nancy, sympathetic to both her husband and son’s plights, tells the latter, “When you’re forty or so, you may look on love as a kind of captivating robber—who chatted so sweetly, as he plucked your destiny out of your pocket.” Meanwhile, Matey instructs Ricky that an artist is about “I-I-I-I,” while a marriage is about “you and I.” Nancy, willing to sacrifice her creature comforts (like cutting down on how many servants she needs) for the sake of her husband’s yearnings, encourages him to return to the easel. 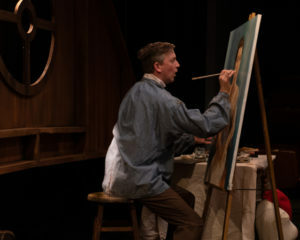 After taking an extended leave from his job, however, and using the family’s beautiful maid Etta (Meredith M. Sweeney) as his model, Matey discovers from his novelist friend, Geoffrey (Mac Brydon)—a cynic with his own art vs. commerce issues—that the portrait Matey believes a masterpiece has sold for a lot of money. However, the buyer is his avuncular employer, G.T. Warren (Albert Warren Baker), who wants to use it for advertising his company’s product line, a prospect that, despite the filthy lucre it will bring, makes the idealistic Matey cringe. Meanwhile, in the too neatly balanced plot, Ronny makes her own sacrifice to ensure Ricky satisfies his dreams. Then, out of nowhere Matey spins the tale of a phony inheritance—uncomfortably displaying Barry’s artifice—as a surreptitious way to eliminate Ricky and Ronny’s financial burdens so that they can live in Paris while he studies architecture. 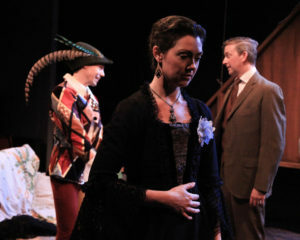 Barry’s play would need a far more polished and well-cast company of thespians than presently assembled by director Michael Hardart to give its dated-sounding dialogue (“Isn’t she immense?” Ricky asks about his mother), stagy characters, and plot contrivances the fire they desperately require. The actors—who do all the scene shifting themselves—work valiantly to embody Barry’s people. Here and there, Hardart has helped them convey some of their roles’ shifting nuances but, with only occasional exceptions (involving mainly Preston, Baker, and Eastwood), they’re unable to make Barry’s old-fashioned, “darling”-sprinkled, upper-class locutions sound natural or, to use the oft-spoken word, charming. 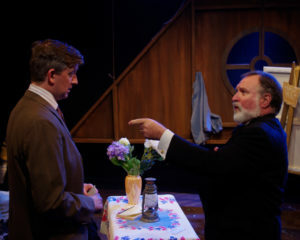 You and I, whose three acts are here compressed to two, with one intermission, reflects the leisurely tempo of a time when audiences could relish watching a play work out its thin plot as they listened to the clever repartee of people so refined they dressed for dinner. But with pacing that lacks the necessary sparkle, and an uneven cast, Hardart’s direction succeeds merely in making the two hour and 15-minute running time seem longer. Unlike the better-financed Mint, situated in the midtown theatre district, the Metropolitan does its labor of love in the heart of the Lower East Side’s Alphabet City, working away in a tiny theatre with minimal visual enhancements. Caitlynn Barrett’s simple, serviceable set suggests a drawing room and attic studio. Christopher Weston lights it all efficiently. Most noteworthy, given her obvious budgetary restrictions, are Sidney Fortner’s period-effective costumes. Typically, one goes to the Metropolitan to become familiar with once familiar plays that would otherwise never be produced. You won’t witness Broadway-quality acting, visuals, or direction, but what you get is always done with respect for the original and an attempt to realize as many of its values as the venue’s limited circumstances allow. 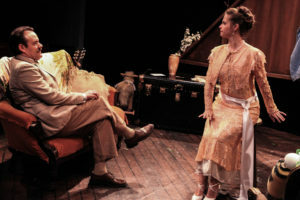 And while a less-than-perfect presentation of Philip Barry’s first produced play, which reveals what 1923 audiences and critics enjoyed, may not be to everyone’s taste, those who love the theatre’s history and lore will want to see the Metropolitan’s revival.